adjustments to his GoPro cameras. Photo by Jeff Kurrus. As a high school teacher, I routinely see all things bad about social media. There may be no quicker way to waste one’s time. But as an outdoorsman, social media provides a platform to keep track of what hunters and fishermen are doing all across the country. 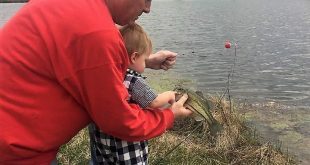 Hunting and fishing photos and videos dominate my Facebook and Instagram feeds and I’m probably guilty of spending just as much time on my phone as my students. In addition to picking up tips on tactics and gear, the outdoor sector of social media has sparked my interest in filming and photography. Capturing moments and experiences on film ensures that the hunt never ends. But as I continue to pursue this new world of cameras, I’ve quickly learned that the professional photos and videos I see online don’t happen by accident. It’s a skill and art form that is completely different from decoy spreads and duck calling. I’m also learning that it’s pretty hard to effectively run a shotgun and a video camera at the same time. And since I’m not ready to hang up my shotgun, I’ve been searching for ways to film duck hunts without compromising my ability to actually hunt. Utilizing GoPro action cameras has allowed my hunting buddies and me to satisfy both cravings. 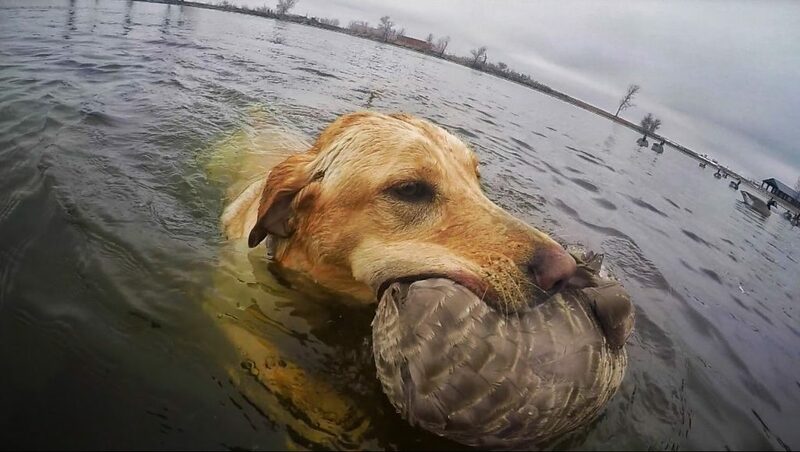 A yellow Lab named Seven spends her birthday retrieving geese and doing what she loves in southeastern Nebraska. 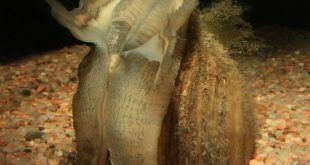 GoPro cameras have a number of advantages over bigger and more expensive point-and-shoot cameras that make them ideal for hunters. They are small, portable, and versatile. GoPro has developed an endless list of accessories, and they are constantly upgrading the technology and capability of their cameras. Older models come standard with a waterproof hard case, which is essential to waterfowl hunters. In newer models, the camera itself is waterproof. Mostly importantly, you don’t have to point and shoot. With a little bit of preparation, GoPros can be strategically placed to capture your hunt without anybody needing to be behind the camera. With that basic knowledge, I figured GoPros would be a quick and easy way to get some really good footage of my buddies and me filling our limits. 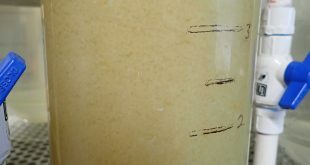 Well, I was wrong – about the quick and easy part and the filling the limits part! By learning the hard way, which seems to be standard operating procedure for me, I quickly learned that despite the versatility, accessories, and the “hands-off” nature of the camera, GoPros also have a number of limitations. Through trial and error over the last couple of years, this is how we’ve attempted to overcome those limitations and come up with a system that works for us. It didn’t take long to figure out that filming from the blind produced less than desirable footage with poor fields of view and bad lighting. To make our footage worth watching, we needed to figure out a way to elevate the camera or get it into the decoys and away from the blind. 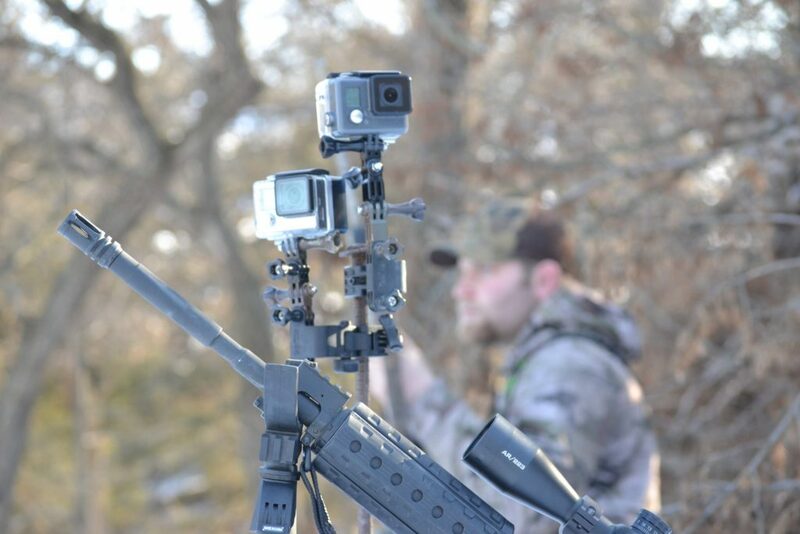 We found our solution in GoPro’s Sportsman Mount. On one end, the Sportsman Mount fastens to the back of the GoPro hard case. On its other end, this case is equipped with a c-clamp that you can tighten around nearly anything. In order to get a better field of view and better lighting, we started attaching our GoPros to varying lengths of electrical conduit that we stick into the ground or into the water. It allows us to place multiple cameras anywhere that we want to maximize the chance of filming something worth watching. 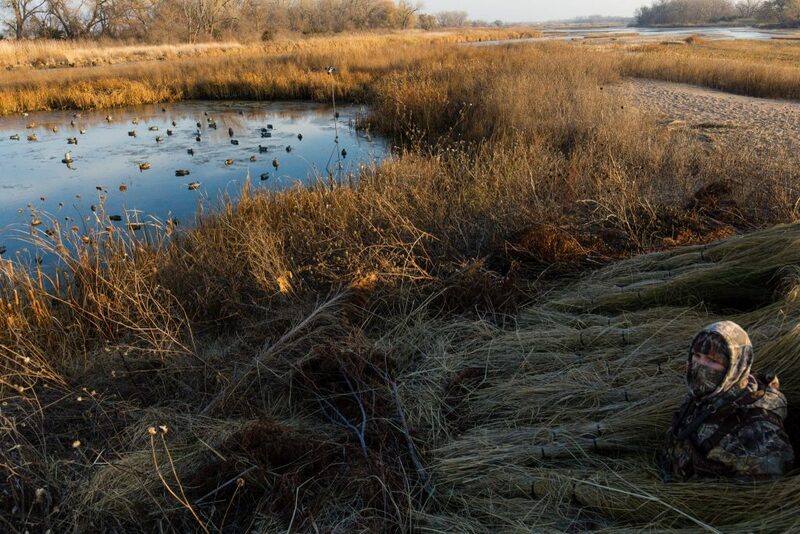 Jadlowski hunts from inside the blind during a duck hunt on the Platte River in Hall County. Photo by Jeff Kurrus. Not surprisingly, that solution led to another problem – the camera is very ineffective if nobody is within arm’s reach of the record button. And since running out of the blind to hit record isn’t a very good option, we needed another solution. Luckily, GoPro makes a camera remote that connects wirelessly to the camera (using the camera’s internal wireless capability) that allows us to hit record without ever leaving the blind. The remote is capable of connecting to and controlling multiple GoPros simultaneously. However, the connectivity range is limited, which is something you need to keep in mind when positioning the cameras. We’ve also fashioned wrist straps using small bungee cords so we don’t have to fumble for the remote at the same time we’re fumbling for the duck call. Also, make sure you stop recording after the action ends (another lesson learned the hard way). Failing to do so kills the remote battery and eats up a ton of storage on the camera’s SD card. 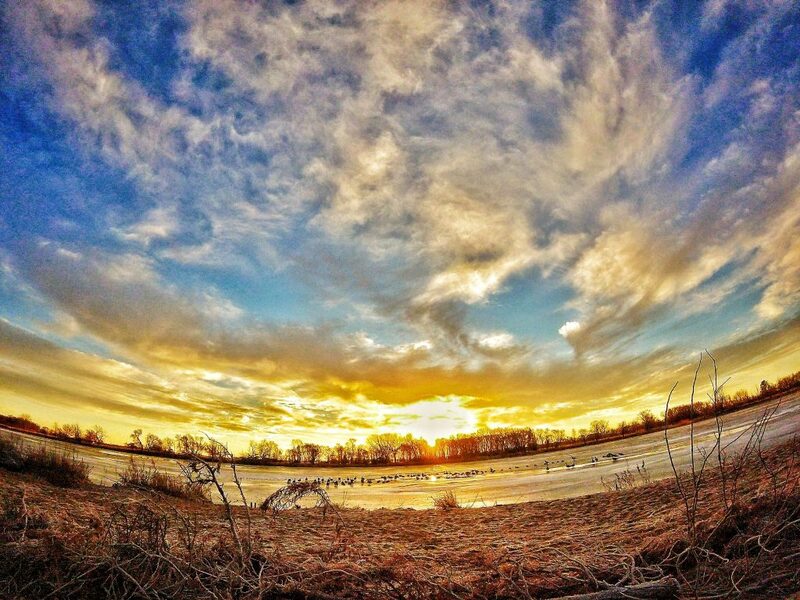 Sunrise illuminates the decoys on the frozen Platte River during a late season goose hunt in Hall County. A major advantage of the GoPro is that it doesn’t require a cameraman. But since no one is pointing and aiming the camera, accurately positioning the camera and setting the field of view is very important. Poor positioning can result in a lot of footage of nothing but blue sky. Some GoPro models have a back screen that allows you to see the field of view, but those get covered up with waterproof backing and external batteries. So instead of just guessing about what we are aiming at, we started using the GoPro App. The GoPro App on your smart phone connects to the camera via the camera’s wireless network. Through the app, you have full control of the camera’s operation and, most importantly, it previews exactly what the camera is looking at. 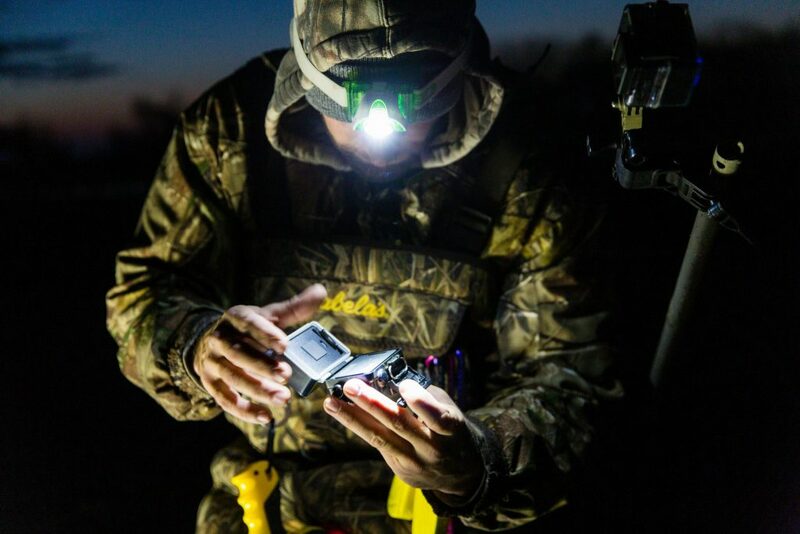 Before the hunt, we quickly link up our phones with the cameras and are able to precisely set the field of view. When the remote battery dies,the app also serves as a convenient back up. Additionally, it allows you to quickly review your footage without leaving the blind or plugging the SD card into a computer. 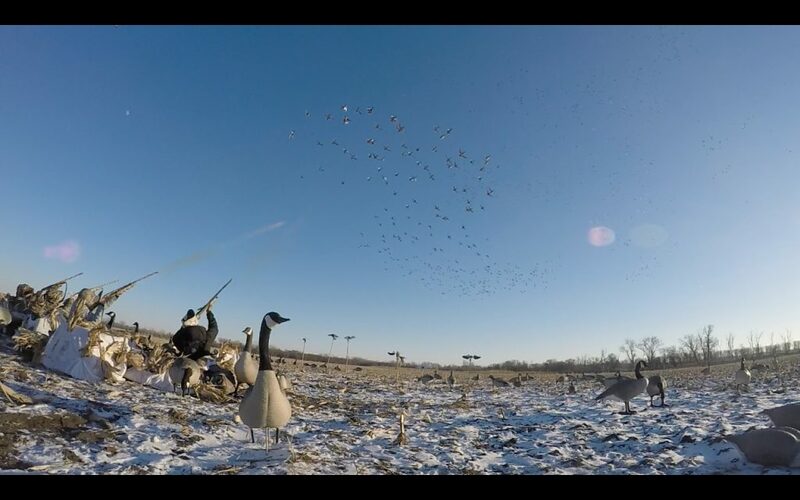 A GoPro Hero 4 Black captures guns firing into a flock of late season mallards in Sarpy County. This quickly became the most glaring flaw in the camera. From my experience, you can only get about an hour of film time on the internal battery – with colder weather draining the battery even faster. Unless your hunting spots are a lot better than mine, your hunt is probably going to last longer than that. So we did some research to find the best external battery option for the GoPro Hero 4 models that we use (other models would require a different external battery). We settled on an external battery made by Re-Fuel that replaces the backing of the waterproof case and latches and seals to maintain the waterproof nature of the case. It gives us about eight extra hours of film time, depending on how cold it is, and allows us to film all day long. This whole operation depends on battery life. Because you’re powering cameras, remotes and a phone, as well as keeping a charge on other external batteries, I have one more tip we use all the time. DeWalt makes a USB charging adapter that slides on to all DeWalt drill batteries. The adapter has two USB ports that allows for the charging of two devices at the same time. As long as you charge your drill batteries before the hunt, you can slide on the adapter and plug in the USB end of all your charging cords to create a mobile charging station that allows you to keep filming as long you’re willing to brave the freezing temps. and coyote hunts. Here, Keith Jadlowski is waiting to call coyotes in Boyd County. When filming, there’s a lot of extra footage and “false alarms” that eat up storage space. Make sure you have an extra SD card for each camera you’re using. And it’s always a good idea to dump all your footage onto your computer to free up space on the SD card before the next hunt. Unfortunately, we have jobs that cut into our hunting and filming careers. Hiring cameramen and buying expensive cameras don’t quite fit into our budgets. We don’t know how to use high tech video editing programs, not that we have any, and we’re unlikely to land a weekly slot on the Outdoor Network anytime soon. I’m lucky if I get more than a handful of “likes” on an Instagram post. But our GoPro system is good enough for us and that’s who our videos are for anyway. They capture our finest moments and our worst shooting. We get to enjoy them together and give each other a hard time. They help us critique our concealment and our decoy spreads. Sometimes we get to show them off to friends and they get us fired up when we’re missing freezing temperatures and strong north winds.